When I walk through my local beer store (which happens much more often than Lady Copperpot would prefer), I’m always looking for what’s new. I do this mainly because, like any good Alehead would, I’ve tasted everything they typically have in stock. I’m there so often that the distributors have started to recognize me. As such, I can pretty easily visualize what each shelf looks like. The Ommegang bombers are next to the Stone bombers, which are next to the bombers of Wachusett Larry. The same bottles are usually in the same places. When they’re not, though, I’ll notice almost immediately. In a recent trip, a new 12-pack among the typical inventory caught my eye. My local beermonger had picked up some sampler packs of Butternuts Beer & Ale. I’d never heard of Butternuts, but they passed the test for me: it was new, it was craft, it was canned, and how could any sentient being possibly resist purchasing the most colorful, whimsical Goddamn box in the industry? Butternuts Beer & Ale is located in the heart of New York state, in Garrattsville. I’ve been to that area of New York state, and trust me: the only thing it has going for it is that it’s not in Pennsylvania. The brewery itself was founded five years back by Chuck Williamson, who converted an old farmhouse (the likeness of which is, I assume, on that cheery box) into a brewery. They brew simple beer, they’re progressive in their use of cans, and they have clearly put a ton of thought and effort into branding (their motto “Nice Cans” is inspired). The rest is history. 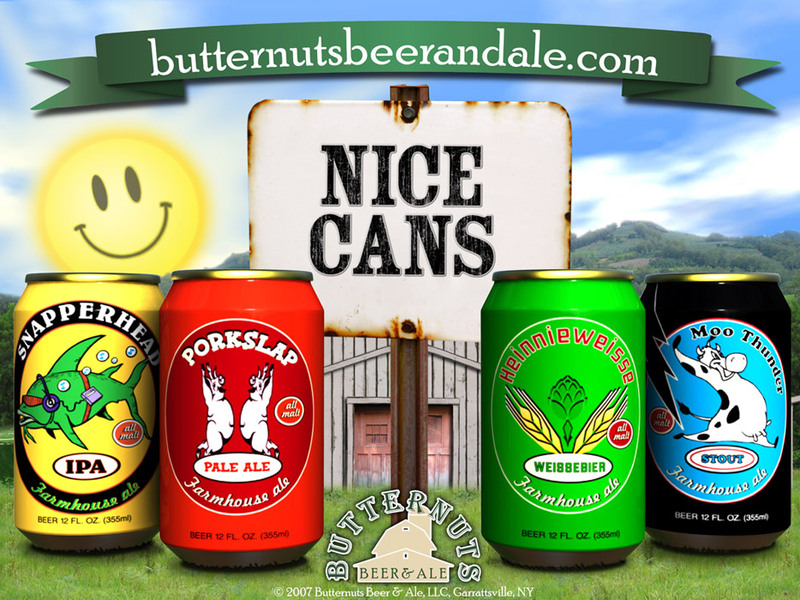 The Butternuts 12-pack consists of four beers: the Moo Thunder (a stout), the Heinnieweisse (a German hefe), the Snapperhead IPA, and a their flagship, the Porkslap Pale Ale (fantastic, fantastic name). I’m not going to go into major specifics on these. To me, they’re all pretty mediocre. The Moo Thunder (4.9% ABV) pours a deep black, with 1/2 finger of head that leaves no lacing. Body is a bit watery. Carbonation is a bit weak. And the aftertaste has a bit too much ashtray for my liking. 2 Hops. The Snapperhead IPA (6.8% ABV) was probably the most ordinary IPA I’ve ever had. Medium everything. Not too hoppy. Watery and lacking oomph. 1.5 Hops. The Heinnieweisse ( 4.9% ABV) poured a cloudy yellow/orange. The nose was redolent with fruits and cloves and cinnamon. I don’t love the style, but this is something you should try if you do like Hefes. For me though, it gets 2.5 Hops. The Porkslap (4.3% ABV) is a watery malt bomb brewed with ginger. Note to self: if you’re going to use ginger, use it extremely sparingly…to the point that you can’t taste it. At all. Unfortunately for this one, the ginger shines through and the hops are imperceptible. 1 Hop. Posted in Ale Factories, Tasting Notes.Tagged 1 Hop, 1.5 Hops, 2 Hops, 2.5 Hops, butternuts, pork slap. I liked the Heinnieweisse. While there are better Hefes there are few in cans. So I’ll say I reach for this one in situations were I want a Hefe but need it in a can (ie camping, poolside, etc.). I haven’t tried the other brews yet. What a damn shame. With a name like Porkslap, it deserves to be better. I can remember Maxim named it one of their favorite brews last summer- that’s why we don’t take beer advice from corporate mens’ rags, kiddies. I wonder if a weak mix pack like this is meant for newbies into craft beer? To pop their cherries with subtle flavors before they delve into the deep end of the pool so they aren’t overwhelmed? From that perspective I can see that Butternuts has a place, otherwise, not so much. My very first IPA was a Gubna from OB- I had tears streaming down my face, my eyes were blinking 90 mph, & I thought my brain & palate were going to explode from the intensity. I almost swore off all IPA’s but I was determined to give the style another shot… and another & so on. I’m glad I did- there are some really great beers out there! Barley left the remainders of a mixed pack at my house a few weeks back. Wasn’t crazy about the Porkslap, enjoyed the Stout, and really liked the Weisse beer. He probably tossed the IPA in the trash before handing over the others since he knew that insults would ensue (Just from your description I think I’ll keep my distance in the future). To add onto Resie’s comment, mixed packs are the perfect entry into craft beer for many newbies. Southern Tier makes one of the most boring mixed packs on the market filled with incredibly approachable yet super boring beers. Give a newbie a Southern Tier Unearthly and they’ll swear off good beer forever after their virgin tongues are permanently scorched. Give them a Phin and Matt’s Extraordinary Ale and maybe they’ll start to appreciate better beer (Though the beer is far from extraordinary). Growing up in the Northeast I took down my fair share of mixed 12’s from Saranac and Nutfield. Not the best beers but an easy way to start trying new styles. I hope butternuts dies a miserable death. Ripped. Totally agree that mix packs are a great entry into craft beer for newbies, but the beer has to be halfway decent. I’m fine with the stout and hefe, but if you’re going to introduce someone to craft beer, you’d better give them a halfway-decent IPA and pale ale. I’m afraid the Snapperhead and Porkslap would send people running back to their macro-lagers.